The bright star is Antares. The cluster of 3 stars in the upper left contains Rho Ophiuchus. The larger globula in the upper right is M4 and the smaller one down and to the left (closer to Antares) is NGC 6144. 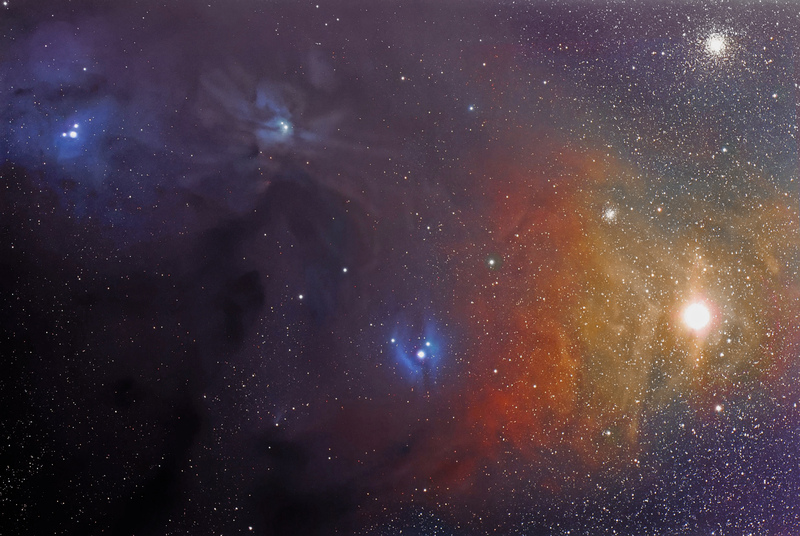 The reflection nebula IC 4603 is in the upper center, and the reflection nebula near the middle center is IC 4605. There are some beautiful dark lanes in the lower left portion of the image extending up to IC 4603. Certainly not a boring area for wide-field astrophotography. Guided with a 2nd STL11000 camera on the 16" RCOS RC using the external guide head on an Astrodon MOAG off-axis guider. 10 min sub-exposures. Data acquisition ranged from about 17-29 degrees above the southern horizon.